Paper planes? I was never quite good at folding them just pointedly and narrowly in the middle, with stylishly flared wings to the sides, as I would’ve liked. Today, you can go online and select and view various styles of paper planes to create. But back in my day (! ), most of us kids attempted the standard-looking airplane. And I was somewhat like Charlie Brown and that dang kite of his, every time I let my slapdash paper plane fly so freely…into the grass! Now, paper dolls? I played with very few as a kid. I’m about to bring it back way and mention two brands in particular that made this happen: Dover Little Activity Books, and American Girl. I was aware that my 1990s version of paper dolls were a throwback to how girls my age, during the Victorian era or World War II, might’ve entertained themselves in-between homework, or helping out with tasks at the family shop. It was also a bit of an experiment, beyond connecting with the girlhood of the past. Among my access to video and board games, cable TV, comics, tween novels, and obnoxious toys like Skip It!, there I was, giving this paper doll thing a try. Was it fun? Not my kind of fun in hindsight. I liked changing their outfits, and a lot of paper dolls from the 1940s onward were fabulously illustrated (some were nearly as beautiful and sassy as your classic pin-up illustration). But a paper doll’s traditional flatness frustrated me. At least a Barbie could kick! Nonetheless, I found them low-key ingenious because of their construction. Paper, huh? That old as bread (and maybe even older) fiber that we all famously learned derived from the cellulose of trees as children. Primarily, it was that same paper that brought these toys to “doll life.” Later on, I learned that paper dolls, like most things, also carried a weighty historical context and is akin to film, TV, and music in delineating the state of cultural mores, and representation in America. 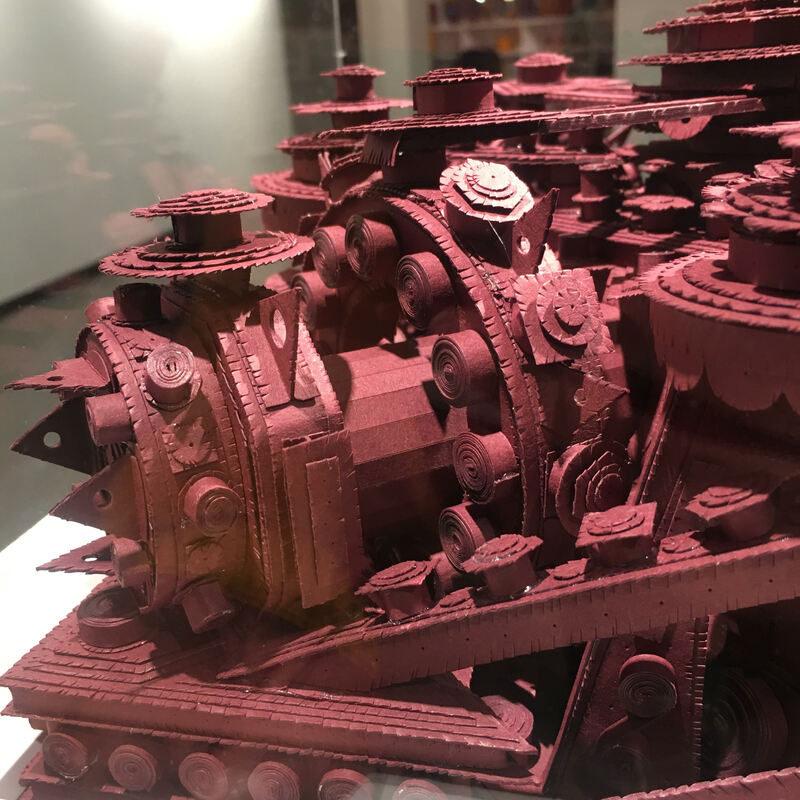 The fact that paper has given us so much to work with, express, and create is the impetus of Pulp + Process, the exhibition currently showing at The Society of Arts and Crafts through April 21st. Pulp + Process (re)establishes fundamental respect for the possibilities of paper. It’s also the first show Sam Aldrich has curated for the Society. He began as an intern in February 2018, and the Beverly, MA raised artist graduated from the Massachusetts College of Art and Design with a BFA in Fiber Studies that following May. 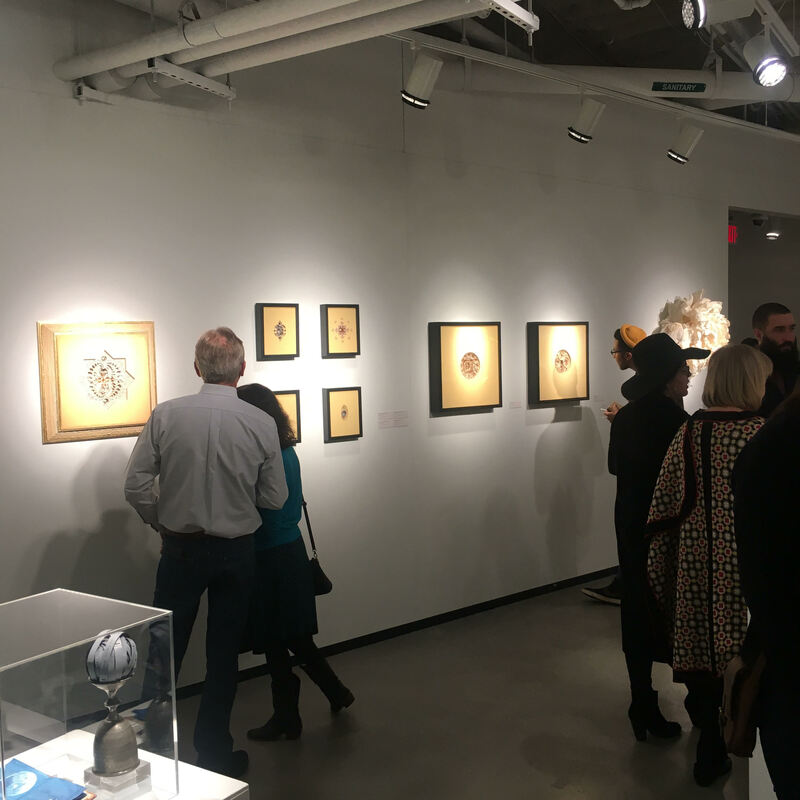 A full year later, at the opening reception of Pulp + Process in February 2019, he was announced in front of a supportive crowd as the Society’s Exhibition Associate and their first ever Emerging Curator. Unless on a college campus or at a very independent gallery, plenty of art observers are used to attending shows curated by a veteran. But seeing a curator right at the beginning of their career, honing their skills in canvassing the art world for the very pieces that speak to the core of their latest exploration, is an exciting moment. Following is a conversation I had with Aldrich about what inspired Pulp + Process and what he gained in developing this show along the way. Q: The name Pulp + Process. How did you come up with that? A: “Pulp + Process” came about because the “pulp” is what all paper is made out of, whether it’s commercially-produced, or produced by hand. It’s kind of this mushy stuff that gets formed into the sheets. The “process” is the part that takes the pulp into its final form of whatever you see in the gallery. With that title, I wanted to relay that to the viewer. That we’re going from the materials and the process—the pulp and the process—to get to what is in the gallery and what they’re going to see in the show. Q: What was Pulp + Process’s opening reception like for you? A: It was a whirlwind for me! I was working, finishing installments of lights right up until the start. I had been climbing up and down ladders for a few hours too. I was hot, dizzy, and sweaty. Then I had ten minutes to get ready, change clothes. Spritz a little hairspray, all the while people were arriving. I think in some ways, that was a blessing in disguise because I was super, super nervous going into the night because I had to speak! Your first anything is a little intimidating. But by the end of the night, people seemed to really like the show. So I was really happy and it felt so great that people enjoyed what I had worked on and had put everything into the last couple of months. Q: Seeing the artwork in person, it was amazing to see what the artists were able to mimic by using paper. A: Everyone works with paper every single day. Doesn’t matter who you are. You either have some money in your pocket. You have a note. Your drink cup. Anything. It’s just that being surrounded by something all the time, it kind of fades into the background and becomes easy to forget. 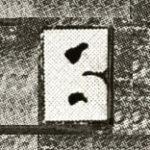 [The general public] may have forgotten how special paper is because it is continually treated as not special around us. Q: We definitely take paper for granted. It was nice to see it in a different light, where we can appreciate it even more. A: Aww, thank you! I’m glad you had that reaction. Q: And what’s it like to curate a show? Is this your first time putting a show together? At least on a larger scale? A: Yes. And doing it all by myself was a huge learning process. I was able to see how it’s done by working at the Society in the past and on other exhibitions with guest curators. I got to see a couple of different ways to organize shows. For me, I’m a pretty organized person as it is. But a lot of making a show happen is keeping up with deadlines, all the different spreadsheets with contact info and what the artists are sending for a wall [display], pedestal, or free-standing. So a lot of different moving parts are happening. But as long as you have your timeline and stay organized, I found it to be pretty manageable. Q: How did you find the artists or the artwork? A: A lot of what I did was searching and looking at blogs that had art. One of them was The Jealous Curator, which I really liked looking at. Reading different articles about other exhibitions. I did receive, from referrals and board members, other people to look at as well. From all the research I did and pulled together, I went through everything and made sure all that I had made sense [for a show]. That I also had a diverse group of artists and artwork. I wanted to give a really good, broad, overarching view of what is being done with paper today. Because it is an incredibly old craft that humans have been working with it for so long. But, again, I wanted to make sure I covered every form of papermaking. Down to extreme detail, to letting the paper do what it’s meant to do and dry how it’s supposed to dry. Were there any artworks in particular that reaffirmed why you wanted to do this show in the first place? A: I think in their own way, each of them did. In my practice, when I’ve worked with paper, it’s been with embroidery. So I’ve made paper and then embroidered on to it. So I know paper from that angle. 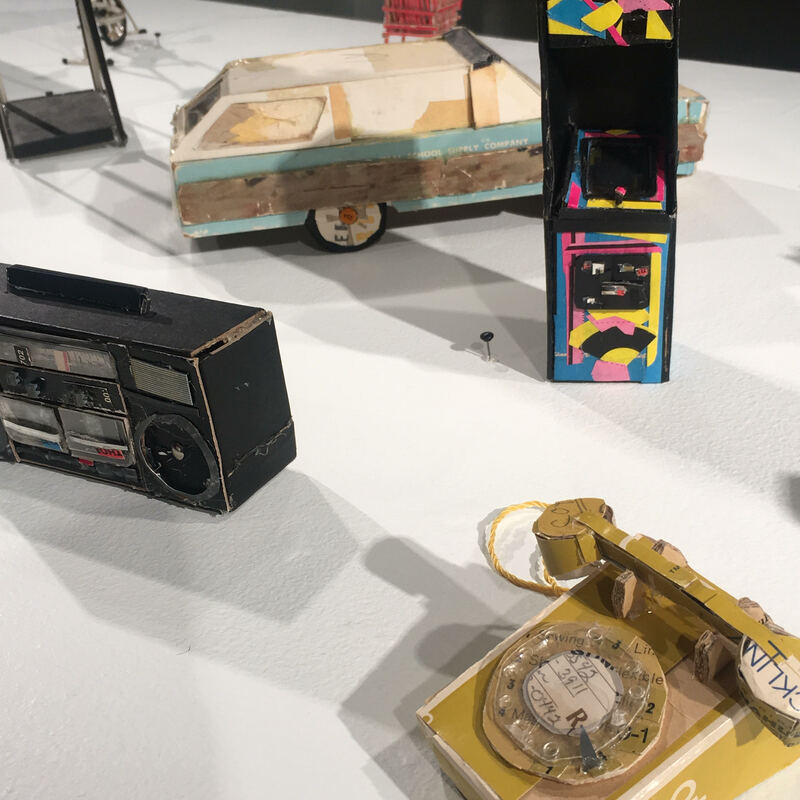 With this show, touching things, installing things on the wall and pedestals, I got to see other people’s angles of paper and how they choose to work with it. Paper is so universal, it’s a language that everyone speaks and you can develop your own unique way of working with it. With each piece [in Pulp + Process] there was something that I could find that I understood in the way that someone was approaching the material and is totally different from how I have in the past, or would think to do. I think it’s really exciting that there are so many different things that you can do with something. That you can do that with any material, really. But I love paper. A: What’s your earliest memory of working with paper? Or that one moment with paper that has stayed with you since? Q: What really opened my eyes to paper was when I was at MassArt and took a paper-making and bookbinding class. It was really incredible to see how the material transformed from those gross, weird leaves into a final product that was so beautiful and different. It’s almost like a butterfly’s transformation. It starts off as this clumpy, gross thing, and then it mutates, and within its final iteration, its forms are endless, the colors, the textures, and it can be and do almost anything. So that class really showed me that and opened me up to that. 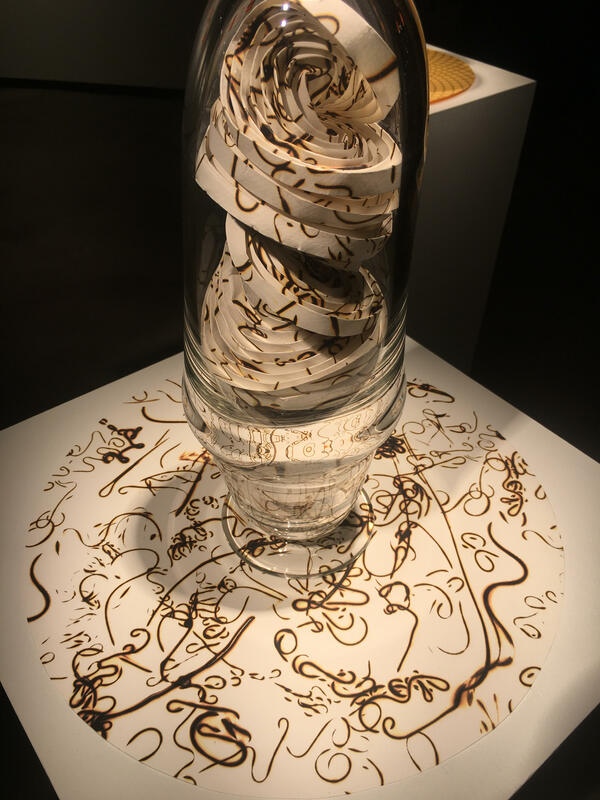 The possibilities of paper. Q: And you started off an intern at the Society, correct? A: Yes. I was interning here in my senior year, which looking back was a very overachieving move of mine! Taking on an internship, while writing my thesis, and working on my thesis show. But it did segue into what I’m doing here now. So even though it was a lot of work during my semester of senior year, and it was really, really intense, looking back on it, I’m so happy that I did it. Q: What’s your role at the Society, currently? A: My official title is Exhibition Associate. Colloquially, I refer to myself as a curator and my colleagues typically do too. I typically will curate shows and I have been doing that. Whether up front or behind the scenes. Q: There was one artwork that was also an opened up book. It had blue paper with text on it, and the moon and mountains. Is that the oldest piece in the exhibit? A: I believe it is. [“A small book about the moon,” 2014, featuring 19th century book pages] is by Jesseca Ferguson and she teaches at the SMFA at Tufts. That piece has been around for awhile. While I think in the gallery, it is important to show work that is contemporary and new, and with that, I mean within the past five years or so, it’s really great when older pieces can be mixed in. It kind of sets the groundwork on what can or comes afterward. I think by also having pieces that aren’t of recent work, it really blurs the line for the viewer, [at least in this case] what is expected of paper. Because unless you look at the date, it’s not like you would know that piece was made several decades ago. It’s strong enough in that it could’ve been made yesterday. And a lot of the paper Jesseca works with, she buys vintage books that were produced a hundred years ago, and that’s another layer of paper. She wasn’t involved with the pulp part of the piece. But through the process of the piece, she still worked with the paper and created this multi-generational, multi time-frame image for the work which is pretty cool. Q: What artists do you look up to? A: I really love, aesthetically, the work of Wolfgang Laib. He’s a German artist, and personally, his work for me takes my breath away. For one of his pieces, he has a series in which he collects pollen, [“Pollen of Hazelnut,” 1992] and sifts it into huge rug-size areas. It’s like a giant square of yellow on the floor. It’s incredible. The first time I saw it, my mind was totally blown that a person could or would do that. So in my practice, that’s the direction I’m interested in. Pushing the boundaries between what and why humans do certain things. Certain activities. Like, questioning purposes and repetitive actions. Wonderful interview Sam. You are fantastic! !